Ok, I'll admit it. 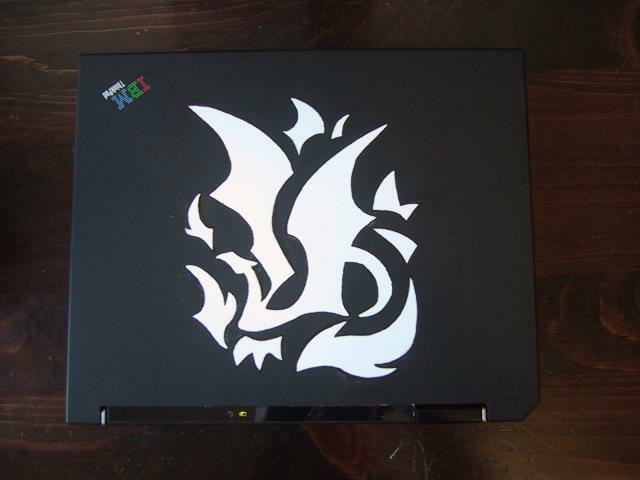 Ever since I saw Hackers I've wanted a painted laptop. I finally got around to finding a good graphic and painting it onto my new IBM x31 Thinkpad. The hardest part was cutting the stencil out. I then lightly coated it with mineral oil to keep the paint from sticking to the stencil. After that, I used rubber cement to hold the stencil to the laptop (being sure to keep the rubber cement off of the holes) and gave it six coats of white spraypaint. After it dried I used Turtle Wax polishing paste to remove some of the overspray, and then edged the white with black ink to give it a sharp edge.